In all the excitement here (What? Did I miss something?) I forgot to check in on the Iron Cowboy. No need. He seems to have done fine without me. 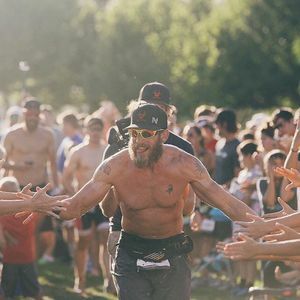 In case you have missed it, American James Lawrence, AKA The Iron Cowboy, completed 50 full Iron Mans in 50 States in 50 days, on July 28th just gone. The Iron Cowboy crosses the finish line. It’s a monumental achievement. One or two idiots seemed to think it was fine to take potshots at him on social media for not being strictly regimental about how he did these. Quite a few of the swims were done in pools. One of the runs had to be completed on a cross-trainer. Plus, he fell asleep on the bike once, which nearly spelled the end for the whole project. But he persevered, and in fact, improved as the saga continued. All his stats are there on his website if you want to analyse them. What caught my eye was his last marathon time. 4.23. That’s my best marathon time. And I didn’t have 49 and two-thirds back-to-back Iron Mans to worry about. And only a cursory glance at his figures would confirm that his strongest disciplines are the swim and bike. If this effort doesn’t inspire someone to get out there and do something, then I’m really not sure what will. He did it to raise awareness about childhood obesity, primarily in America, where he hails from. But that’s not a problem unique to the States. Here in Ireland we have a massive issue with obesity too (pardon the horrible pun). It’s showing up already in the rapid rise of Type 2 diabetes amongst youngsters. Our adults are (sadly) leading the way for our kids, with the World Health Organisation stating that Ireland is set to become the most obese country in Europe. This isn’t a crusade on my part. There are plenty out there doing that already. And I love chocolate as much as the next man. And beer. And pizza. But call me old fashioned… I think you have to earn it. If I go out on the bike for a couple of hours and burn off a shedload of calories, I can afford to throw a few back on, even if they come out of a nice chilled beer bottle, or a tub of ice-cream. It’s a balance. And you know when that balance is out of whack. And no-one else is going to fix that for you.